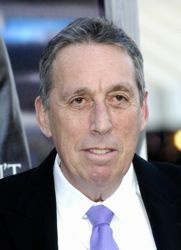 Earlier today, ComingSoon.net had a chance to talk with director Ivan Reitman about his underrated 2014 football drama Draft Day. Before the end of the interview, we wanted to throw in a quick question about Reitman’s 1984 movie Ghostbusters, which celebrates its 30th Anniversary this year. Anyone who reads this site will be familiar with all the talk over the past few years about Sony Pictures wanting to produce a third installment and/or relaunch the franchise with a new cast, possibly even an all-female version under the guidance of Bridesmaids director Paul Feig. We asked Reitman about his continued involvement with the project and some of the developments that have been going on, and he explained to us why he decided not to direct another “Ghostbusters” movie. We also asked whether the rumored sequel to his 1988 comedy Twins, which would team Arnold Schwarzenegger and Danny DeVito with Eddie Murphy for Triplets was a real thing that might happen someday. “I’d say it’s very much in the development stage and it’s now caught up in the middle of studio stuff,” he explained. Draft Day is available via Digital Download on Tuesday, August 19, but you can read our full interview with Reitman sometime before the movie’s DVD and Blu-ray release on September 2. The original Ghostbusters, meanwhile, will be getting a 4K digital re-release on August 29 in theaters for the 30th Anniversary.